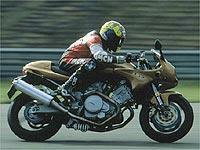 Voxan is set to make a comeback having been rescued from bankruptcy. For more details on Voxan’s rescue, don’t miss the July 3 issue of MCN. The French firm has been saved by Didier Cazeaux, who paid just 457,347 Euros (£295,291) to buy the company as a going concern. The commercial court in Clermont-Ferrand, which was overseeing the sale of the firm, chose his offer over a proposed management takeover. Cazeraux says he hope to restart production by the start of 2003. During the first year, he has promised to invest a further 1.5 million Euros (£1 million) and Voxan has been set the modest target of selling just 700 bikes. Cazeaux, 48, has a good track record in turning around failing businesses. He bought Guy Couach, the luxury yacht firm, in similar circumstances to Voxan’s back in 1996 – it now has an annual turnover of £21million.